Superman #44, by Peter J Tomasi, Patrick Gleason, Doung Mahnke, Jaime Mendoza, and Will Quintana, is the part three of the Bizarroverse story. 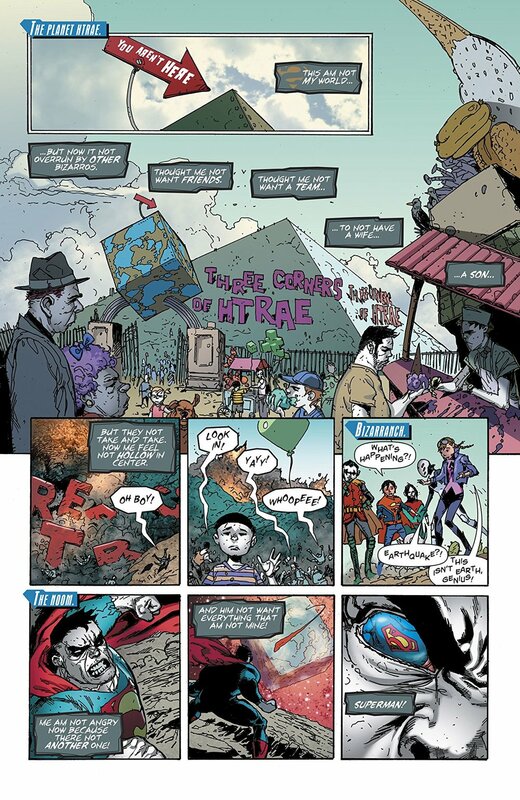 Will Superman, Superboy, Beacon, and Nothing be able to save Htrae, the Bizarro Earth? As Superman and Bizarro tussle, Beacon’s, Superboy’s alien friend Kathy, sensors pick up that Htrae is about to implode. The planet is connected to Bizarro, its creator, and he’s been feeling that they whole thing was a waste, that because there’s a planet of Bizarros now, he’s no longer special. Superboy, Beacon, and Nothing come up with a plan to save Htrae. With the help of Boyzarro, Robazarro, and Hawkzarro, they tackle the Legion of Fun, the Bizarro version of the Legion of Doom, to rescue the Super Foes, the Bizarro version of the Justice League. 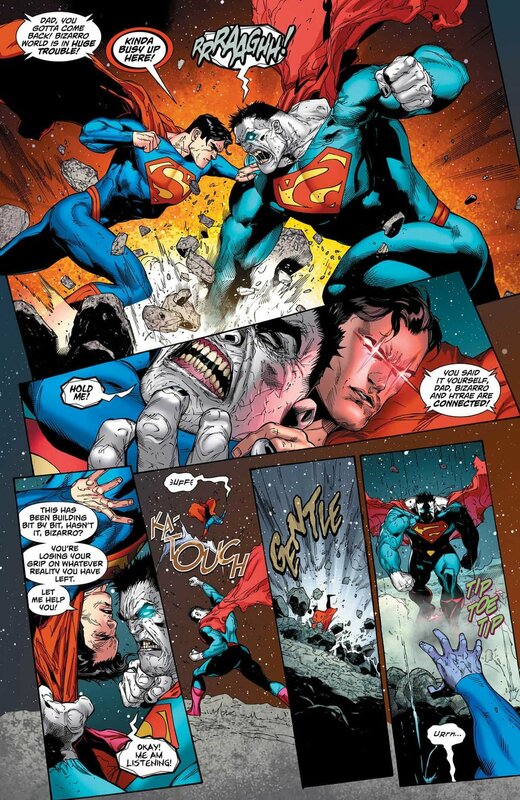 Superman is able to reason with Bizarro and the two of them come and help the other heroes. The freed Super Foes decide they’d rather have Superman for their leader, angering Bizarro and matters aren’t helped when Bizarro Lois shows up, telling Bizarro she’s going to leave Htrae. Things start to fall apart again and Superman and company are forced to evacuate Htrae… but not before taking a special passenger. This issue does such a great job showing the disparity between Superman and Bizarro. A lot of writers write Bizarro as a total comedic character or go too far in making him a dumb monster version of Superman, but Tomasi and Gleason find lots of ways in this issue to show what he was always meant to be, the opposite of Superman. He thought he wanted a world of Bizarros, but feels that it makes him less special. He thought he wanted a family, but he hates them. 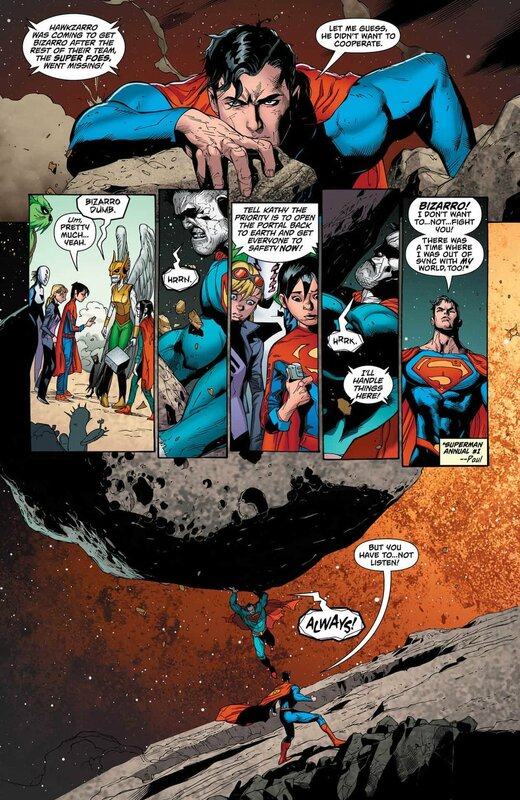 He decided to try and help Superman save his world, then gets jealous of Superman when the Super Foes praise him. He’s fickle, jealous, angry, and doesn’t care about his world or the people on it. This is what Bizarro should be. It makes perfect sense, since he’s the opposite of Superman. It’s just a little quirk of characterization that Tomasi and Gleason take and elevate to the next level. Beyond that, there’s a lot of other great little things in this comic. The Bizarros’ onomatopoeia is a highlight of the issue, as it’s the opposite of what’s happening in the panel. For example, instead of KA-BOOM, it’s KA-TOUCH. It’s a little thing, but it’s perfect for the atmosphere of the comic. Superman making Superboy the leader of the group trying to save Htrae while he fights Bizarro is a nice touch. The Legion of Fun is pretty cool, too, the Jo-cryer being a standout. There are problems with the issue and they stem from that Legion of Fun/Super Foes plot, though. The end of the last issue made it seem like it would be more important to the overall story, but here it just feels welded on, an extra hurdle for Superboy and his group to get over. The story wouldn’t have suffered at all if it was excised and more pages were given to plot of actually saving Htrae and the clash of the Kent and Bizarro families. It’s fun, but it feels like it is just there to pad the page count. Doug Mahnke’s art is great in some places, not so great in others. His Bizarro is big and hulking, a legitimately scary physical presence. His fight scenes between Superman and Bizarro are wonderful, detailed and epic. Later in the issue, though, when there are multiple characters fighting in panels is when it starts to degrade a little, getting muddled and a bit sketchy. It’s a shame because the panels themselves are well set up and the fight is choreographed nicely. There’s also a few times when his faces are kind of inadvertently terrifying. Superman #44 is a good ending to a what was shaping up to be a great story . The creative team nails it when dealing with Bizarro and Superman, but when it pulls out for the other things going on around them, it pales a little bit. It doesn’t ruin the whole thing; this is still a really good story and the best Bizarro story in a long time. The first two issues of this arc were amazing, setting up everything so perfectly and while the ending of this is good and works, it doesn’t fit the set-up. It’s a bit disappointing, but still worth the read.